They don't have a prayer of landing it... do they? The original offer that Green Growth Brands (CSE:GGB) floated for Aphria Inc. (TSX:APHA)(NYSE:APHA) felt like a stunt, because it was a stunt. A press-released intention to do an all stock deal for an industry bellweather by a well-backed junior that nobody had ever heard of until that moment. It put GGB on the map as a company that knew how to get pot market-grade attention. Now that they’ve submitted a formal offer, it still feels like a stunt, but not an impossible stunt. Fundamental Hype presents: A look at Green Growth Brands and their chances of sticking the landing on this Aph bid. The formal bid, released by GGB Tuesday, wasn’t well received by management, but wasn’t rejected outright, either. APHA’s response press release starts of hard in the title, “urging” shareholders to “take no action” with respect to the GGB offer, but doesn’t end up rejecting the notion out of hand. 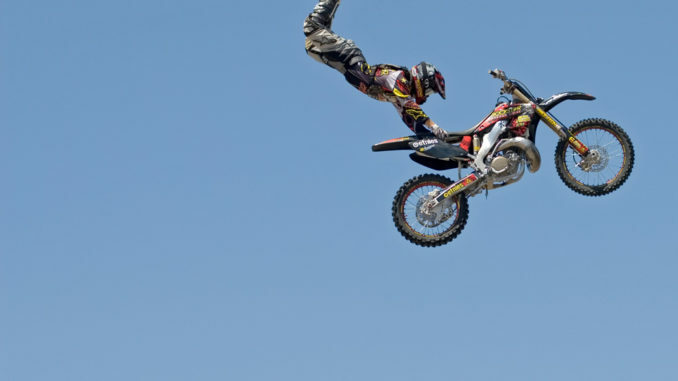 In keeping with their preferred posture of methodical professionalism, Aph management make a few notes about how it looks like a lowball right now, and tells the shareholders that they’ll come up with a formal recommendation after the special committee is finished doing a formal review. Aph may look like they’re trying to politely laugh these guys out of the room and tell them to come back with something a bit more serious… and they are… but they’re also trying to send a message to both the bidder and their shareholders about who’s in charge here. They’re telling their base not to worry because – despite what a cabal of evil short sellers and their FUD-spreading minions might tell them – management is very capable and have the shareholders’ best interests in mind. The ones that give the bid a chance (or just complain) have been down-voted into the cellar. And we’d like to give a big Fundamental Hype shout out to redditor tomford5213 for being what we expect is the voice of the silent masses. What’s the bid here, exactly? Since it’s an all stock offer, let’s have a fresh look under the hood of the company being tendered. Nevada Organic produces out of a 12,000 sqft facility in Post, NV, and sells through a dispensary called “The Source.” It was acquired post-RTO by way of business combination, and appears to be a good earner. It showed $9 million in top line profit off of $18 million in revenue in the year ending in June, 2018. In NO’s life as a private LLC, it produced a tidy revenue and distributions to its members. In the 1 month that they were an operating pubco, they cleared $1.7 million in wholesale and retail sales. Top line profit was $844,000 for a 51% margin. They’ve got an option on a dispensary in Henderson, NV, and licenses for 7 more, though it’s unclear where and what state of build they’re in. Surely, they’ll be looking to maintain that margin as they scale up. 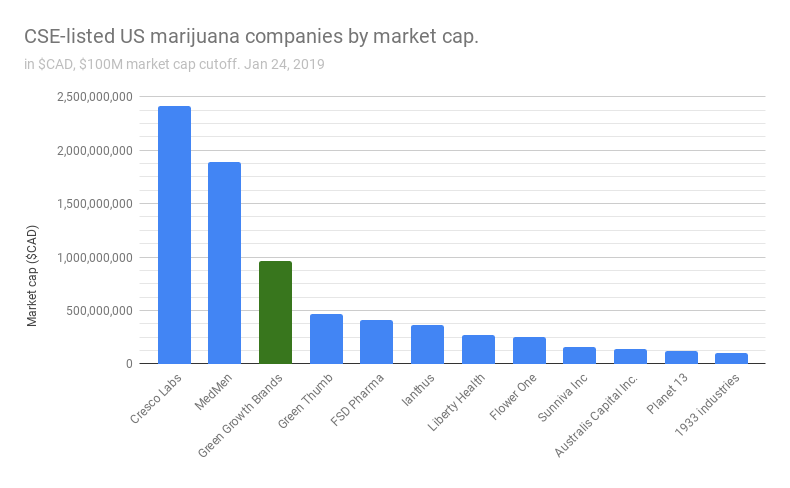 Today, GGB is third in market cap among CSE listed US Potcos. An operation in business-friendly Nevada with top-to-bottom vertical integration (cultivation, processing, distribution and dispensing) that spits out nearly $2M CAD a month isn’t nothing, but it isn’t, as their bid claims, 63% of the value of Aphria; whose operations generated $24 million last quarter selling 3,400 kgs of product equivalent (35% growth quarter to quarter). The expansion potential at GGB consists of eight Nevada dispensary license applications to be fed by their cultivation & processing facilities if and when they’re approved, and another application for cultivation and dispensing licenses in New Jersey. Aph’s planned buildout in Canada, where it already has licenses and an established market is thirsty for supply, is presently being held up by Health Canada licensing. GGB’s charter allows for the issuance of proportional shares that out-vote common shares 500-1, and are entitled to be paid any dividends issued in the same proportion. That 500:1 ratio also applies to potential shareholders asset distribution after a dissolution or liquidation. They can convert to common shares at 500:1. This is a Master Limited Partnership (MLP)-style structure that we’re seeing a lot more of in the pot space as US hedge funds and private equity get more involved. The structure is often used to keep company founders and primary backers isolated from opportunistic corporate raiders looking to steal the company cheap during a market lag (sound familiar?). The structure sort of broke the market’s brain at first, because Canadian speculators aren’t used to it. MLPs were born out of deals that the street was just BEGGING to take public, but whose management were unwilling to to give up control votes to any bozo with the money, but could use the bozo’s money just the same. Wall St. didn’t really care, because they’d securitize the public library and sell it if you gave them a chance. Not all management control blocks are created equally. Privateer Holdings’ control block in Tilray Inc. (NASDAQ:TLRY) (explained more thoroughly here), is obviously the most high-profile one in the space. It’s our opinion that Green Thumb Industires’ (CSE:GTII), whose preferred shares vote with the same weight as the common shares in the event of takeover offers – is the most reasonable of this new-to-Canadian-ventures structure. 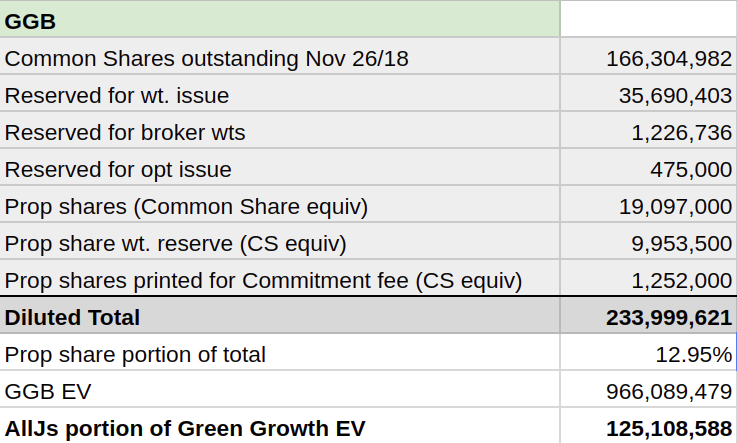 Green Growth’s share structure consists of proportional voting shares, and it’s different than the founder-stacked cap table, with B shares floated on a market that we see in TLRY or GTII. The GGB preferred shares are effectively just 500 share bundles, that all happen to be controlled by the same outfit, and don’t trade until they’re converted to common shares. It’s the same outfit that’s committed to back this takeover, and we’ll get to that in a minute, but first let’s count this all up. Presently, there are 38,194 proportional GGB shares issued, and another 19,097 reserved to be issued upon exercise of warrants. Fully diluted, those shares add up to about 30 million voting share equivalent, almost 13% of the company. AllJs LLC has a 13% interest in Green Growth Brands. It’s worth $125M today. All Js Greenspace, LLC owns all of the prop shares. They’re the same backer who committed to a $150 million lead order, contingent on this offer being accepted as-is. The commitment scores All Js another 2,504 proportional voting shares, whether the APHA deal goes through or not. 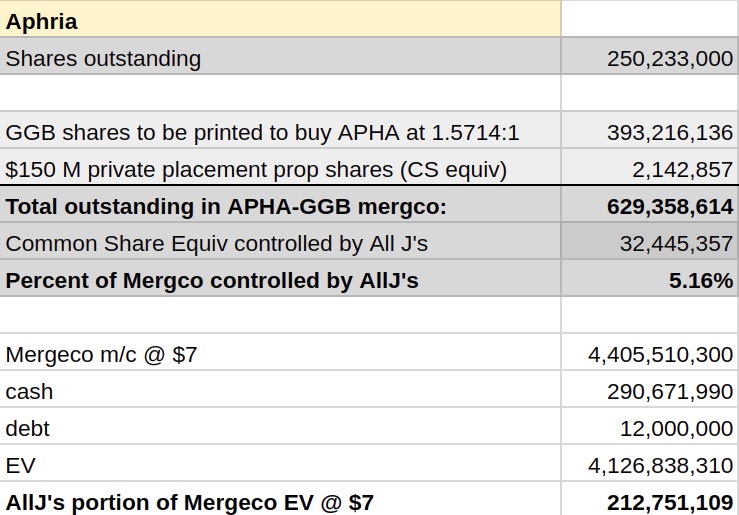 Add the commitment fee and the stock they’ll get in the $150M raise to the stock they already have, wrap it all up in a notional GGB-APHA merger, and it gives All Js 5.16% of the merge-co at the offered ratio. Assuming that deal comes together, and the Mergeco trades at $7, AllJs LLC will be sitting on a $212M position in a much larger, much more developed company, with $300 million in cash and at least 4 times the output. Not counting the warrants, they paid $57 million for their initial stake in GGB, add in the $150M they committed, and their all in cost is $207 million. 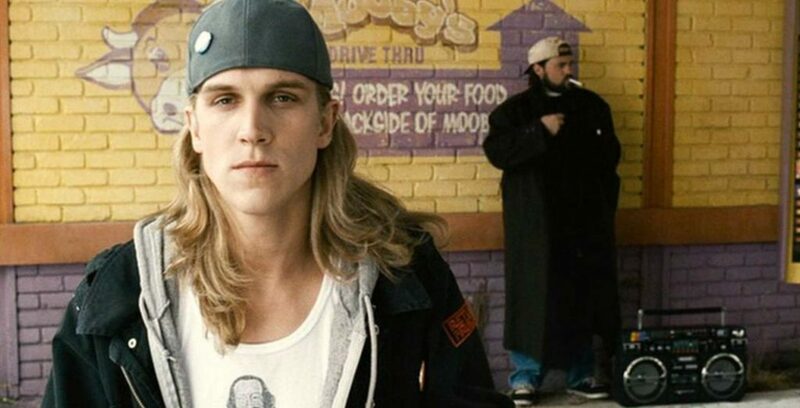 We don’t have any pictures of All J’s Greenspace LLC, so here’s a picture of a better-known Jay, operating a more traditional marijuana dispensary. In the background, his silent partner. Why Would AHPA shareholders want that? Presently, they don’t. But time is a linear construct, and this all-stock bid from underwear company operators controlled by an opaque capital syndicate being central to the narrative isn’t making them any happier about being down on their trade. Aphria is supposed to be the anti-Aurora. It built its operation from the ground up to run like clockwork, instead of promoting itself to a size that enabled it to bully its way into all-stock deals of its own for tight ships like Medreleaf and Cannimed. Shareholders expect Aph to be that tight ship. And they are! Aph just put up the biggest quarter by units sold EVER. It’s on Aurora to beat them next month (on the strength of the MedreLeaf & Cannimed facilities that they bullied their way into)… but the market isn’t co-operating for Aph. The black eye from the LATM deals and short report isn’t fading. The forums are still cracking jokes about “where’s the line by line rebuttal?” There are special committees and a CEO on his way out “eventually.” Business fundamentals or not, this company looks beat up. The longer it takes APHA to come up with some market traction, the more disgruntled this base gets. 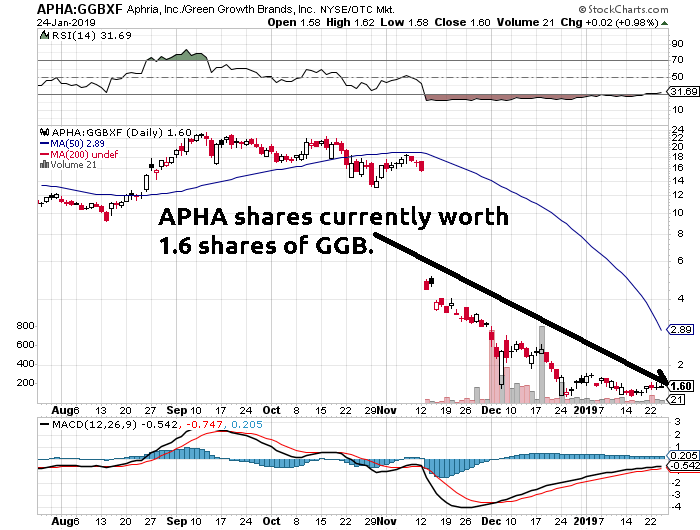 Today, following the GGB offer, APHA’s response and All J’s backing commitment, a GGB share buys 1.60 APHA shares. Mathematically speaking, GGB is playing with the house’s money. The commitment fee (paid in stock to their cornerstone shareholder) plus lawyer and press costs have put them in a spot where outperforming APHA over the next 3 months can have Aph shareholders asking themselves why they wouldn’t take that deal.